DRIVERS: Valtteri BOTTAS (Mercedes), Lewis HAMILTON (Mercedes), Sebastian VETTEL (Ferrari). Q: Good luck buddy. Over to Lewis – that looked like a bit of a recovery job too. Turn 2 on the first lap looked like a bit of a moment and then a stunning second lap and it was really tight with Valtteri. Good recovery, mate. Lewis HAMILTON: Yeah, not too bad I’m happy with it. Valtteri did a stunning lap on the first run and I had a bit of a mistake and that kind of ended the run. But I’m really happy with the second one and this is a great result for the team and Valtteri deserved today. Q: Have a good one tomorrow, mate. And Valtteri, well done, listen to the fans here, they’re pretty pumped up for you buddy. Your first lap was sensational, your second lap to find another tenth at that level. You can see what it means to these two guys. It was an incredible combination of those two laps. I know how hard that is. Run us through your session buddy? Valtteri BOTTAS: Yeah, the whole weekend we have been making good progress with the set-up. We had the new bits this weekend for the car. There’s been some work to get the car well balanced with those and finally we did and the car felt so good. In the last run I knew that there was a tenth or so I could improve from the first run and I managed to find it. Apparently I needed it! Q: You looked at one with the car, there’s no question about it. For tomorrow’s race, I mean I don’t want a start like you did last year – that looked a bit tricky in terms of almost jumping the start. So you’re on pole, you’ve got to get a beautiful start again and try to control the grand prix from there I imagination? Valtteri BOTTAS: Yeah, you just a good clean start, nothing amazing, no need to be a hero in Turn 1, and then go for it. I can guarantee I’m more hungry for the win than anyone on the grid, so I’m really ready for it. Q: Valtteri, your first pole position of the season and you pulled out a great first lap in Q3. How good was that to set up your final attempt to secure pole? VB: Yeah, thank you. For sure, here it’s a short circuit and that’s why we normally see quite small gaps. It’s actually not an easy circuit to get everything right, even though there’s only seven proper corners for us, but it’s quite easy to make a mistake, so getting that first run, a nice lap on that one, it helps. I could kind of build on that for the second run and improve on it. Q: Congratulations. Lewis, you said on the grid yourself that you made a bit of an error, I think at Turn 3 on your first run in Q3, so how much margin did you have to leave on your second lap to get a time in? LH: Well, firstly congratulations to Valtteri, he did a fantastic job and ultimately he deserved the pole today. It had gone relatively well through the weekend, the pace was good, it was quite good throughout qualifying, it was obviously very close between us all. Right at the end I think I made a mistake on the first run and when you don’t have your first lap as a banker, you're kind of building from scratch for the second one, so it always helps when you get a good first lap in because then you can try to improve on it the next time. But the next one was really good and obviously it was quite close between us, which I’m happy about and it’s still a one-two for the team and lots to play for tomorrow. Q: Seb, we saw yesterday two one-two results for Mercedes in those practice sessions but then you were quickest in FP3 and in Q2, so do you think the margin to the front two in qualifying today is representative of Ferrari’s pace? SV: I think so. Well, I think there was a little bit more in me, I mean I had a tough start in Q3 with an error, then it’s not that easy to recover because I knew I need to put a good lap in, otherwise I’ll start quite far back. Yeah, I don’t think it was enough pace in hand to be a threat today. I think we need to make sure we improve from where we are. It seems that in quali at least we are a little bit behind right now. I think the tracks we went to the last two weeks are quite different, so we need to make sure we keep pushing. For tomorrow though, I believe the car is stronger in relative pace for the race, so it should be a close fight. We’re starting again on different tyre compounds, so let’s see what we can do. Q: (Scott Mitchell – Autosport) Sebastian, during qualifying there was a small incident with Carlos Sainz Jr’s Renault. Could you just talk us through that from your point of view please. SV: yeah, I mean I passed him on my fast lap in Turn seven/eight and then I was looking down and in the main straight I didn’t see him. I was turning into Turn One, trying again because I was thinking that he must be there somewhere. I don’t know if he was pitting or starting his lap – but as it turned out, obviously, he was trying to go for a fast lap, I couldn’t see him. I wasn’t told on the radio, so I can only apologise to him. Obviously, there was no intention. I was looking down the straight and then I turned around, Turn One, I was done with my lap and just wanted to make sure – and then when I was looking, there was again nothing to see after Turn One, which obviously, which was clear because in the replay I saw then that he was side-by-side. So, that’s it. Q: (Heikki Kulta – Turun Sanomat) Congratulations Valtteri. Do you think you need the same kind of mega-start like last year to win the race as well? VB: I think it’s a relatively short run into Turn One so I think you need a normal start. Of course, you always try to get a good one – but I think to actually lose a position here or to gain, there needs to be quite a big difference with the starts. So, I’m aiming for a good start. Q: (Christian Menath – Motorsport-magazin.com) Question for Seb. You mentioned that you have to catch up now because you have had two different tracks where you’ve been behind in qualifying. Do you have an idea where you lose the time? Is it cornering, long corners, braking, wherever? SV: I think here’s very close anyway, so it’s not, y’know, that many corners. I think from what you’ve seen, we’re losing a little bit in sector one, and then mostly though in sector three, in which I think Mercedes is very competitive, very quick in the second turn – which I always mix up. Lauda? Berger? Berger? Lauda? I don’t know – Turn Seven. And then up the straight, so they appear to be able to carry more speed through there and then up the hill. I think that’s one of our main losses. I think the last two corners are not too bad but I think it’s the very high-speed Seven and Turn Nine, so the first one, the second last corner. It’s close. We’re not talking about much but obviously enough to get ahead. Q: (Livio Oricchio – Globoesporte.com) Sebastian, do you believe that Mercedes have made a great step forward with the new spec of the car, and on a more regular circuit like Silverstone for example, will we see this step forward by Mercedes even better? And will it mean that Ferrari must increase the development of their car from now? SV: Well, obviously they have the exact numbers of what they expected and what was delivered. They obviously had some new parts here again, I think, so for us it was largely the same as last weekend but for sure, we are having our own schedule in terms of new bits and I think we are pushing as hard as we can but as I said, we also need to make sure that what we bring to the car is making it faster so it’s a constant challenge. For now, I think, the last two qualifying sessions Mercedes seemed to have the edge a little bit. It can turn around, the next two, who knows, so I think we need to look at ourselves? There’s always something you can learn from other people and what they put on the car, but that’s not just for Mercedes, that’s for all the teams. As I said, for tomorrow I’m less… not worried anyways, but less of the opinion that we are behind. I think we are more of a match in race pace, so let’s see what the day brings tomorrow. 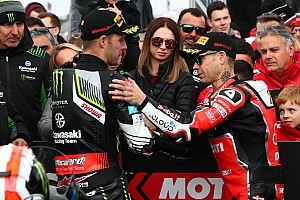 Q: (Scott Mitchell – Autosport) Valtteri, you talked through the importance of the banker first lap but just how good was the second lap for you and also how important was it to bounce back today like this after the latest bit of bad luck last weekend? VB: Yeah, I think the first lap was really good but I think there was a tiny bit of track improvement for the second run. It’s always difficult to say how much but I think the second lap was very similar to the first one. I think I improved one tenth or so but yeah, I had some good laps in qualifying three so really enjoyed it and the car really allowed me to push. We’ve found a very good balance with the car so enjoyed it… and what was the second question? VB: Well yeah, for sure it’s nice to have a very good result but it’s only qualifying, the race is tomorrow but for sure we need to enjoy today a little bit but it’s tomorrow what counts. 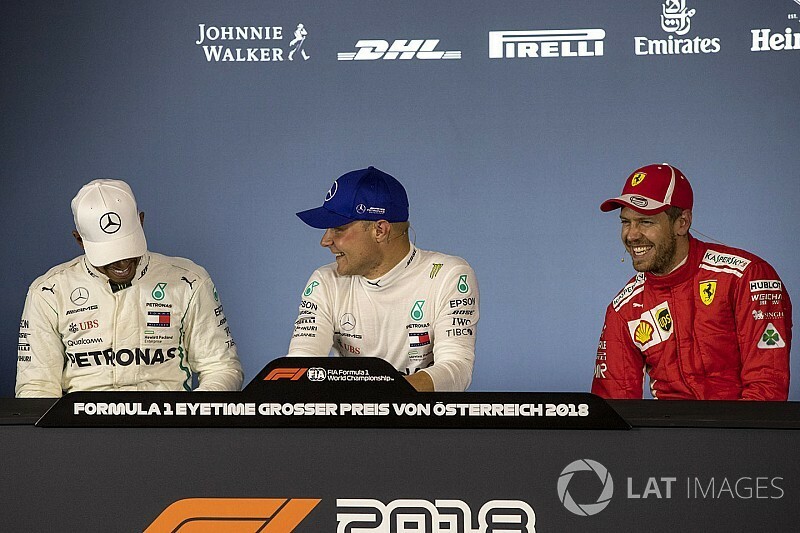 Q: (Heikki Kulta – Turun Sanomat) Lewis, how difficult is it to start on the front row when your teammate is in front of you? LH: Obviously when you’re on the front row and you’re on your own and when you’re first you’ve got a clear view but it’s no different to being third or fourth, it’s the same. Q: I think part of that question was relating to compared to maybe a rival team’s driver alongside you on the front row compared to Valtteri? LH: No different. There’s no difference. Still racing.